Freelancing involves doing more than just producing work – for the second day of our bootcamp, participants focused on the other aspects of working for themselves. 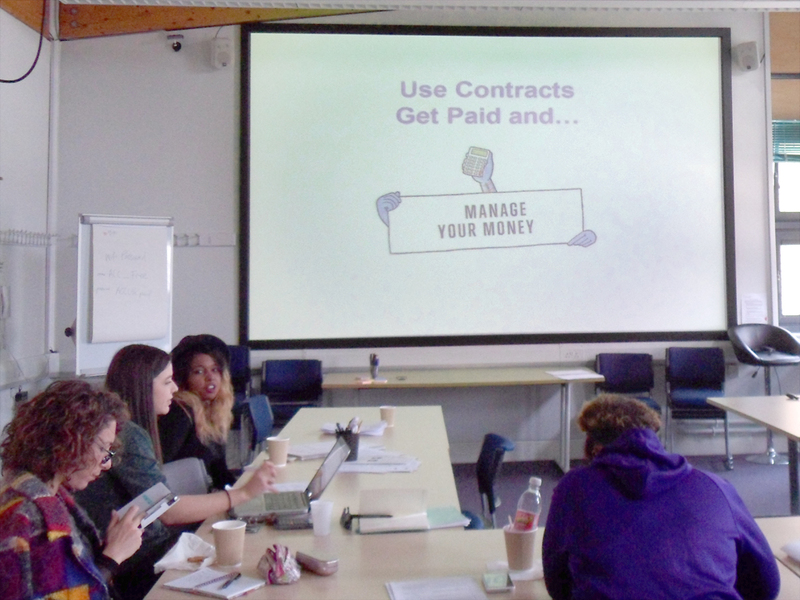 When starting out as a freelancer, it’s important to decide how to set a price for your work – we learned about working out an hourly rate, using contracts and getting paid by clients. It’s also vital to make an action plan. Creating specific, long-term and short-term goals can help to make your ultimate aim feel more achievable. Decide what needs to be done today, in a week’s time, a month, or by the end of the year! Thanks to everyone who attended – we hope you’re all feeling more confident about freelancing, and good luck! Red Lemon Club – is “a refuge for creators, artists, inventors and entrepreneurs who want to make more out of their skills and talents.” This platform helps freelancers learn to market their work and build a following. The Design Trust provides lots of online resources and free training for freelancers in the design industries. Cockpit Arts provides space and business support for designer makers. Enterprise Nation members can “access advice, meet-ups, exclusive discounts and eBooks” and become part of a supportive community. Monkfeet isn’t just for creative freelancers – they have classes on everything from business essentials to technology, for all kinds of entrepreneurs! Creative & Cultural Careers provides job listings events, as well as workshops and courses to help you build the skills you need. The Business & IP Centre at the British Library provides advice, workshops and events to help entrepreneurs in all stages – whether you’re running a business or just starting out. We have a programme coming up this year which may be useful for anyone wanting to start up as a freelancer! Applications for the Summer Hatchery will open soon – visit our microsite to find out more and register your interest. And – you can visit our events page to check out what else Accelerator has to offer!